This is a detailed account of the domino effect of what happens when you don’t have your original design files but you need to have marketing materials created. Not having access to your original design files can effect you in a variety of ways. In this particular instance, this author needed one of those 70″ tall x 30″ wide vertical banners made. However, she is traditionally published, and as we all know, the authors are the ones who are actually doing the marketing for their books (most of the time). To properly market your book, you have to have a variety of graphic files at your disposal. Fast forward to this coming Thursday, which is when the author needs this banner for a very large and important conference. Her VA is unable to get the banner uploaded to VistaPrint because her images are extremely low-res. Business is often about relationships, and I have been friends with this VA for a long time, so I heard her cry for help in another blogger group we are in together and I reached out to her. As we talked through the project, I learned that the author only has a few jpgs of her files. This is rarely sufficient. In this particular instance, even if the jpgs were “high res”, there is so much more to it than that. A 1000 x 1000 pixel high-res jpg is only good up to 1000×1000 pixels. The vertical banner in pixels is 5200 x 2200. On top of that, I only wanted to use a portion of the image for the underlay. That means that particular portion needed to accommodate 5200 pixels in width. Her publisher was unable to get us the needed files in a short turn around, so there was only one thing we could do in the rush of the project and that was to have a scan fest, lol. So the author’s VA had to scan in the covers at 2400 dpi (and dropbox them to me) so by the time I got it placed, it would meet the minimum 300 dpi requirement for print projects. On top of that, I had to photoshop out some of the text on the image so as to not interfere with the styling of the banner. I am not complaining about the project. I love to work and design and help people out. But my cry is if you do not have your original design files or some other arrangement with your designer/publisher for the necessary graphics for marketing purposes, please do that today. Do it before it’s an emergency. Here is a photo of her IRL banner. Unfortunately, her author photo is not as crisp as I would have liked it to be, but I was limited to what I had to work with. As a designer, I don’t like to turn out anything that is less than perfect, especially when I know 1000’s of people are going to be seeing it. Other designers, authors, and publishing houses who see this in person are just going to think that I didn’t know what I was doing, while some may know exactly what happened because they’ve experienced the same thing. Now that she understands what’s needed to create high-quality marketing materials, she is working with her publisher and her photographer to get her what she needs for next time. 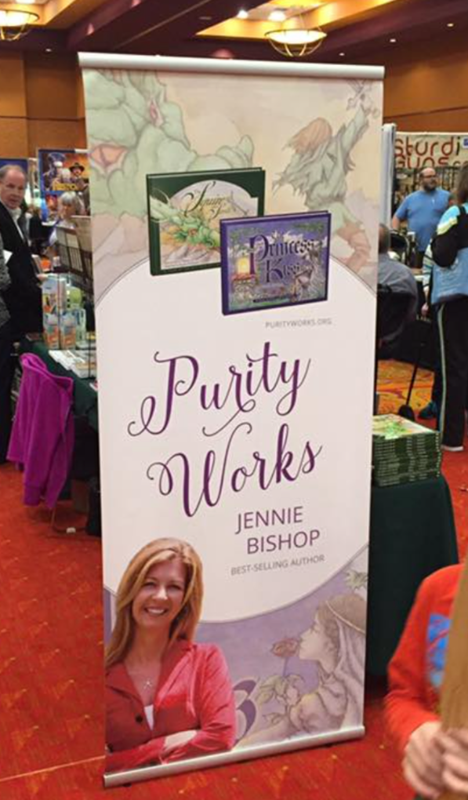 PurityWorks.org provides materials to help parents teach children that sexual purity starts with the heart. 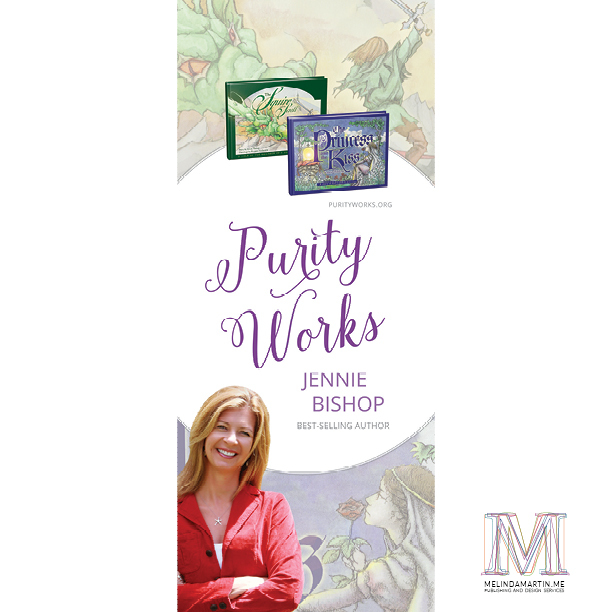 Founder Jennie Bishop is the best-selling author of The Princess and the Kiss and Planned Purity.